The Bramsche/Osnabrück-based contractor operates 75 vehicles to reliably transport metals, paper and cardboard, and other goods for the automotive industry. For about 18 months, the company has been using Trimble’s CarCube on-board computer to manage, monitor and optimize its transport processes. Berghegger’s in-house Transport Management System (TMS) and the Trimble FleetHours payroll and expense accounting program were easily integrated with the telematics solution. 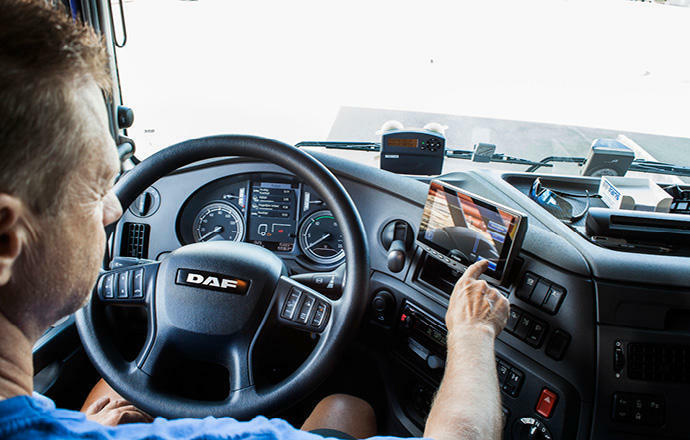 “Telematics was not new for us,” said Bräuer. Berghegger switched to Trimble’s CarCube in early 2015, and the solution has been in use in all 75 vehicles ever since. For fleet manager Bräuer and his colleagues, the most important factor in the vendor change was the reliability of the solution. Our dispatching staff is dependent on the system in everything they do. If it fails, our team does not have the resources to manage and monitor the logistics processes manually. It is impossible to call 75 drivers individually and ask for information. The Trimble solution combines navigation, communications, and analytics software, and automatically sends all vehicle and location data to the dispatchers. 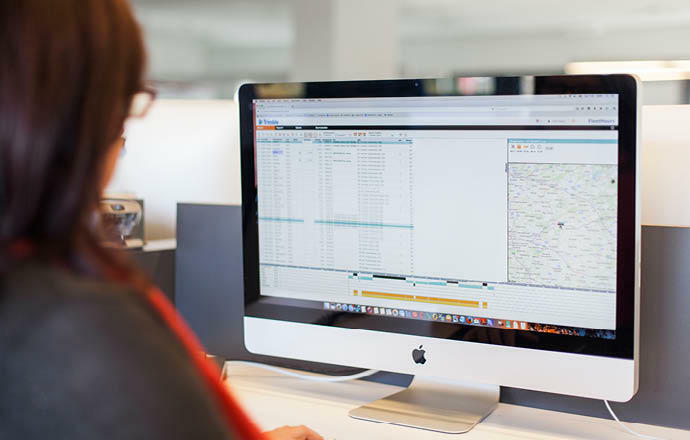 Berghegger’s TMS is integrated with the software, so orders and order status information are also passed between the dispatching system and the drivers via the on-board computer. With Trimble, data transfer is completely seamless. This was not always the case with other suppliers. For Bräuer, it is good that the software and hardware for on-board computer is a closed system that can only be configured and managed by Trimble. This means everything comes from a single source and we have specific individuals we can call if we have any questions. With Trimble support available 24 hours a day Berghegger opted for the Trimble solution. The software is very stable, but it is always good to know who to call if there are problems. So far, Trimble support has only had to answer a single question from Bräuer: as the transport company gradually familiarizes itself with the many functions of the CarCube, how can they best be integrated into the workflows? Berghegger always gets a fast response. “We already know the people at Trimble very well and that makes it easier to communicate,” said Bräuer. The company’s payroll procedures are also more straightforward with the new solution. In addition to the CarCube, which supplies key data, Berghegger has installed FleetHours, Trimble’s automatic payroll and expense accounting program. The data from CarCube is transferred directly to the system so drivers no longer need to note down their driving and rest times by hand. FleetHours generates the accounting data from the information which drivers have to enter into the CarCube anyway. “This link between telematics and accounting is unique. It saves us a lot of time and keyboard work,” said Bräuer. After 18 months, the fleet manager’s conclusion is entirely positive. Trimble’s hardware and software does everything Berghegger wanted its new telematics system to do. Before implementation, the company tested products from different vendors in a brief test phase. There were no major differences in core functionality, but the vendors did have different strengths. Ultimately, it was the reliability of the system and the staff that gave Trimble the edge. Bräuer and his team were quickly won over, directly implementing the system in the entire fleet after initial trials in early 2015. “It feels good to just know that everything will work,” said Bräuer. According to him, that’s when a telematics system really comes into its own. Martin Berghegger GmbH & Co. KG is a Bramsche/Osnabrück-based contractor with 75 vehicles and 140 employees. Berghegger’s main activity is the transport of metals, paper and cardboard, and other goods for the automotive industry.